You no longer need to remove your pack to get items with the bright green and black Mt. Pickett 18 Backpack from PAXIS. This bag features ARC Swing Technology, a unique system that swings a shuttle pod right to the front of the wearer. Just tug on the adjustable release to initiate this action. After you've grabbed your gear, simply swing the shuttle pod back in place and continue on your way. It carries up to 5 pounds and has an exterior mesh pocket, interior zippered pocket and built-in wallet. This bag has a capacity of 18 liters, which is comfortably carried with padded shoulder straps and a hip belt. An ergonomic back panel is padded and vented for comfort on the trail, and allows perspiration to evaporate. NYLAR Ballistic Fabric is water resistant, and waterproof zippers help keep contents dry. A free-standing design ensures the pack won't fall over when placed on the ground, and a waterproof bottom prevents groundwater from seeping in. A daisy chain allows you to lash additional gear on the back. A high-visibility lining makes it easy to spot items stored inside. There is a tablet pocket to stash your electronics as well as a soft interior pocket that provides protection for delicate items. Two interior zippered pockets further add to the organizing abilities. Quench your thirst on the go using the hydration port. Keep your cell phone or other small items at the ready with the exterior accessory pocket. Two side pockets provide a place to stash trekking poles, tripods, or fishing equipment on the trail. Box Dimensions (LxWxH) 21.102 x 15.748 x 9.291"
Mt. 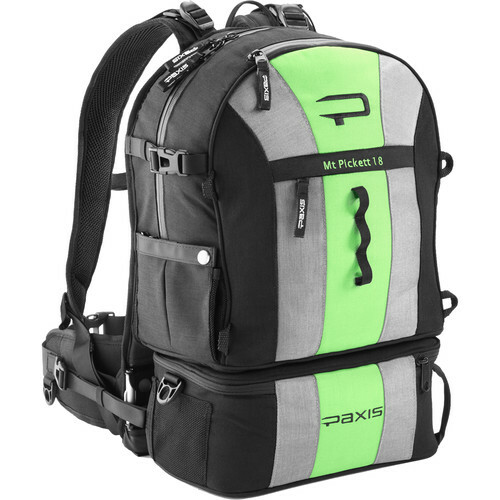 Pickett 18 Backpack (Bright Green / Black) is rated 4.0 out of 5 by 7. Rated 5 out of 5 by BackpackingHill from Great Idea! I bought this pack just a few months ago and it has helped out so much on my college campus. Aside from the overall excitement and questions I get when I wing the pod around, it's so useful. It's so easy to access stuff without taking the pack off. One thing that I was really impressed with was the rigidity of the pod. I put things like my phone, camera, and even a sandwich in the pod because I know that they will be kept safe. Also I loved the comfort of the straps and pads on the lower back. It really keeps the weight of the pack tight to my body while even riding my bike. Overall it is a great pack and I would highly recommend to photographers who need quick access to their equipment in a short time. Rated 3 out of 5 by Anonymous from Not the best for me I think the backpack is well made, waterproof and fits nicely on my back, although I did find it quite heavy for the size even with nothing in it. Not quite good enough for hiking with the my camera which I wanted it for. My camera just fit in the swing-around to the front part but the weight of the camera made the bottom hang down on the front so wasn't particularly comfortable plus the weight of the camera and the bag itself is way too much for the small amount you can pack into it. I will possibly keep it because I don't want to go through the hassle of sending it back. Overall well made pack but not suited for what I wanted it for. Rated 5 out of 5 by Anonymous from Very convenient I have been a casual photographer for over 30 years, and in that time, I've gone through many back packs. As a smaller sized woman, it is has never been easy to find one that fits me, and is comfortable to wear. I've tried some name brand bags, that were regular back packs as well as ones that flip around for inside access. All ended up not quiet working and I would hike with a lens on my camera and one in each hand so that I could change quickly. This pack has solved that problem. I store my 2 lenses that I use less often, in the bottom swing around part, and, if I need them, it's a quick pull on the release lever. The bottom can be fastened in the front or pushed back and locked. What really surprised me was that I was able to pull the straps tight enough for the pack to really fit me, something I've not been able to do with any others that I have bought. I hiked around for 5 hours with this on, and did not feel strained. I will warn you, the pack feels heavy when you pick it up, but is very well balanced on, and that feeling goes away. I would definitely recommend this pack to anyone looking to purchase it for a camera bag. Rated 3 out of 5 by Red Fox from Heavier (empty) than you might expect Swing out bottomw does work. I deal for fishing to too heavy for simple hiking. It is easier to just take a pack of this size off and get what you want (versus and expedition-sized pack). Rated 4 out of 5 by jose paskin from Nice but it does not fit my mac book air 13. Nice but it does not fit my mac book air 13.